This story is every bit true. It happened about three years ago. Since then, I was so damn lucky to be a friend when he needed one. I went over about every week or so and took groceries, drove him back from the doctor, etc…but this is how it started. I wrote this the morning he died. I’m gonna try and write more of them so I don’t forget any of the stories. The first time I ever went to Guy’s house, I had meticulously cooked BBQ that morning and took him over a bunch. When I got there, he was quietly staring out the back of the sunroom and drinking coffee, and he offered me a cup. I accepted his offer and he asked how I liked it. I usually drink my coffee with the flavored French vanilla creamer or milked and sweet n low’d to death. As I was about to respond, I quickly peered into his cup and it was pitch black, so I squeaked out “black is good”. He poured this cup of the strongest darkest lipid-like sludge I’d ever seen…the kind that stains the glass pot brown and it doesn’t come off even in the dishwasher. I winced at each sip but was determined to finish it. As I downed the last sip in some ill-fated attempt at masculinity, his words rang “Want another?” just before my mug hit the desk of the self-rolled-smoke-filled sunroom. My only option was acceptance, and if I remember he was already en route to the pot before I’d even responded. He staggered back to the kitchen and while he was gone I took stock around the room and marveled at Suzanna’s paintings and the books and stacks of magazines, old cassettes and graph paper scribbled with words used as daggers to the heart. He returned with two mugs, stumbling just before the entry to the sunroom and falling against the door jam. I pretended that there was something wrong with the floor or carpet, not acknowledging that his mortality had just been unveiled to someone who previously looked at him like an immortal or Greek god that escaped Mt. Olympus. I dabbed up the coffee on the carpet, only then noticing the stains where the same course of events had no doubt happened before. I helped him to his seat and we began to talk about the encroachment of urban sprawl on Nashville. 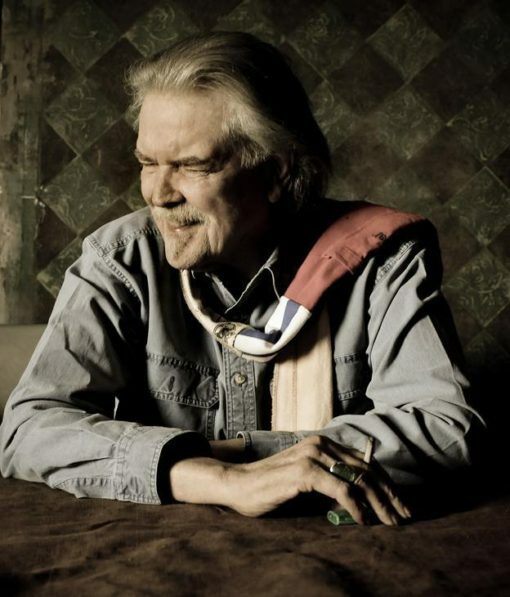 We talked about Monahans…and I learned that Guy shared the same love/hate relationship with Nashville that I do, yet he had given up the idea that he might one day return to the land that molded and shaped him like Terry Allen does with bronze. We talked touring. And Townes. And we sat in an awkward silence, probably much more awkward for me than him, as we were on his turf and he had nothing to prove to me. As I painfully downed the end of my second cup of what I can barely refer to as coffee, he said “well, should we try this BBQ?”. We moved to the kitchen table. This was not long after Suzanna had passed away, so we didn’t really bother with plates or serving dishes or even vegetables. This was a man’s meal with any debutante’s formality removed. As he surveyed my ribs, chicken and the most choice slices of brisket I had selected just for presentation, he keyed in on a small Tupperware container loaded with the fatty remnants of the ends of the brisket. As he reached, I began to discourage him and explain that he should freeze that portion for those days when he couldn’t bear to leave the house but needed sustenance on top of his chips or flour tortillas. I held my tongue though and let him reach. He opened the lid of the container and his eyes made a surprised jump I hadn’t at all expected. “Ah…the chopped…this is what I’m after.” I felt like he was searching the desk drawers for his fathers Randall Knife the afternoon of the funeral, knowing it had to be there somewhere and not totally satisfied until he made the discovery. I watched him empty the container I’d intended for the rainy day into a bowl and carefully drizzle my homemade BBQ sauce over the meal, making sure to thoroughly soak the meat but not cause a flood in the bottom of the dish. He held the bowl in his hand close to his mouth and closed his eyes as he took bites. He explained that his mom used to chop her briskets and that each bite reminded him of a little piece of home. Of Texas. Of younger days. We didn’t talk much after that explanation…and partly because I was too scared to try and interrupt his flashback with culinary tidbits or filler questions I already knew the answer to from the years of reading and studying this man. He finished the bowl and set it on the table. He looked up and said, “Man, I think you just saved my life” in that unmistakable voice and timbre with the familiar relaxed exaggeration that I had heard on stages and recordings for years. As if I’d passed a muster, he looked me in the eye and said “Well, you wanna go down to the workshop”? I was struck that he didn’t say “my” workshop, just “the” workshop like it belonged to not only him but to all of those disciples of his songwriting and his guitar building that had also been invited down to that basement. I spotted #11, the guitar he crafted in 2007 and once put into my wife’s hands to write a song about tomatoes and changing times. As I reached for it, I gave a look back as if to verify that I could try it out…like a son reaching for a rifle a week or so after his dad has taught him how to shoot it. His eyebrows raised a little in both a surprise that I would want to hold it, but also a nod of approval from someone proud of their trophy. Since the first notes I pluck every single time I pick up any stringed instrument are the beginning lick of “LA Freeway”, I was careful not to follow my same pattern and cause some awkward fan moment in the inner sanctum of artist creativity. After dancing with #11 for a few moments, Guy seemed to be interested in the interest I paid to his secondary craft. I laid the guitar back in her stand and he immediately broke the silence with “here, try this on for size” as he handed me yet another homemade instrument, either #8 or #9. After another couple minutes we swapped out yet again. Each instrument I took and played had a different yet distinct feel. He explained the woods and the grains and the fretboards and the planning and all the things I have no experience in, but I nodded and listened like I knew all about the details he shared. Finally, I grabbed some old Martin that I guessed to be pre-war but wasn’t sure…but I’m still pretty sure it was a guitar I’d seen him holding on one of the early record covers. It felt and sounded so beautiful and I knew it had probably given him a hundred songs, but it hadn’t been crafted just specifically for him like the ones he’d built. It didn’t sound just like that distinct rattle on the low E when you play a power chord that I always try to replicate, not a theft but an homage from me to Guy. After Guy was sure I’d sufficiently played with his toys and he was nearing the need for a nap, he said “well, you want one more coffee before you go?”. God. The coffee. My hands had just stopped shaking from the mainline of caffeine (and maybe a little from the fear) that my hero had pushed upon me an hour or so earlier. But that offer of coffee was not just an offer of coffee, it was also a finish line of my first day with Guy and I wanted to prolong. How could I pass up an extra ten minutes on that journey, even if it meant forcing down yet another cup of swill without the flavoring I so sorely desired? Should I tell him I wanted milk or cream? Should I ask if he had something to cut the darkness of his blend? At this point I was committed. “Yes sir, I guess I better have another”. We made the journey upstairs. It was then I noticed the chair sliding up and down the stairwell. I don’t know if I missed it or if maybe he walked down the stairs on his own, but it was clear that at this point he wasn’t confident in climbing back up them. He sat down in the white plastic chair with his back against the wall and gave me a little smile as he pushed the button to ride the lift to his destination. priceless story. Everytime I read one of these it makes my day. Thanks Jordan! What a wonderful story! I too crave to know more about the life of my favorite Texas artist of all time! Thanks so much, Jordan!